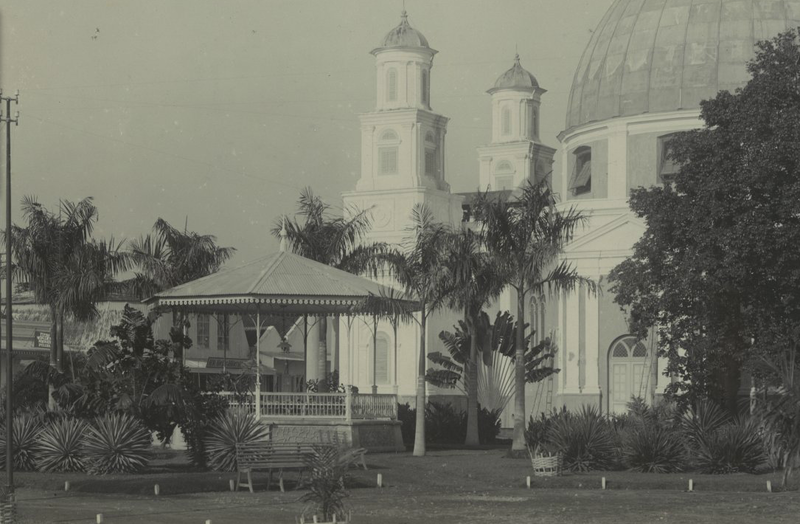 Taman Srigunting or Srigunting Park, the bigest open space in Kota Lama (eng: Old Town) ares and Gereja Blenduk, the domed shaped church marked as the landmark in the heart of this almost three-century old neigborhood. Taman Srigunting in the old days was known as Parade Plein. The name was taken from the parade of the Dutch-Indies Army that often held on this park which cames from the military baracks not so far from it to the north. But long before its turn into a park or lets say a public open space, it was a cemetery or in Dutch known as kerkhof. It can be understood if it was an kerkhof as in the old days, most of the cemetery for the European was next to the church. Even the word kerkhof itself was taken from the word kerk and hof which literaly translated as church yard. 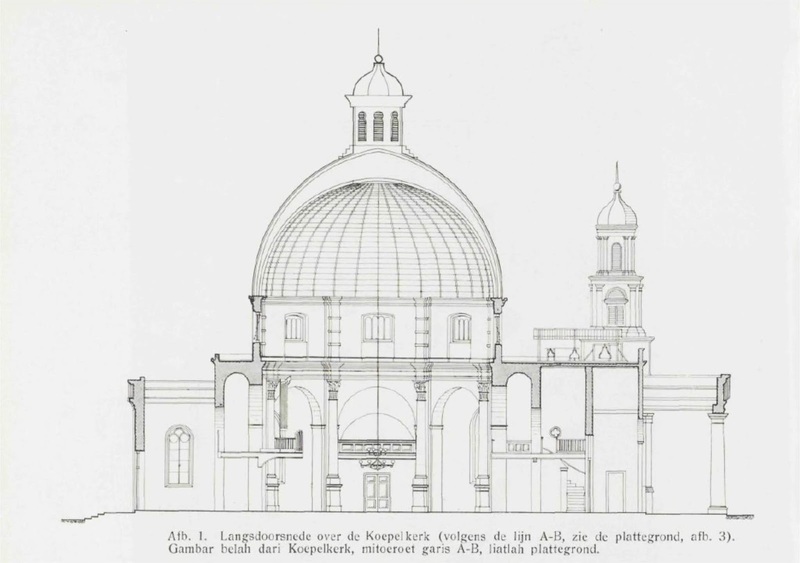 From Sriguntings park, if we faced to the west side, we’ll see the building that become one’s of the Semarang city landmark, Koepelskerk or widely known as Gereja Blenduk. According to an arcticles written in Locale Techniek in 1939, the structure once was destroyed by fire, caused by lightning strike. Its completely devastated the church as well as its archives, thus no accurate data about this church on its early day of its establishment. However, a walled marble inscription mentions that the present church, has been completely renewed in the years 1894-1895 by H. P. A. de Wilde and W. Westmaas as the architect. Actually this church has a similiar exterior with the Willemskerk, present-day Gereja Immanuel in Jakarta. But the architecture of that church is more strictly classical than Gereja Blenduk of Semarang. With the smaller scale of the facade, the charming towers next to the main entrance and the elegant crowning from the dome, this church has more cheerful character, then her stately sister in Batavia, old name for Jakarta during the colonial period. From the list of pastors commemorated in one’s of the walled inscription , it appears that reverend Fredericus Montanus, preacher at Semarang from 1778 to 1814, inaugurated Gereja Blenduk on October 19th 1794, made this church even older than the Gereja Immanuel in Jakarta. Srigunting park, now becomes one’s of the popular public space in Semarang city. Every day, many people spent their time over there. To study, to take a rest, or just spent their time with their friends. Anyway, more people comes to Srigunting park, the littering problem also become a threat to the park. wish the people who visit this park also taking a responsibility to keep it cleanliness every time.